The pioneering bluegrass guitarist George Shuffler has died April 7. He was 88. Shuffler, one of the forefather’s of bluegrass defined the genre with his then unique cross picking style (cross-roll) as it came to be known inspired by Maybelle Carter’s lead guitar lines and Merle Travis’ finger picking style. George Shuffler played for groups such as Bailey Brothers, had a 20 year stint with the Stanley Brothers, and then with Ralph Stanley and His Clinch Mountain Boys. George Shuffler was inducted into the International Bluegrass Music Association’s Hall of Fame in 2011. At a little past noon today, George Shuffler was called up to join the Angel Band. For all of us who have tried down through the years to fill his shoes in Ralph Stanley’s Clinch Mountain Boys–Larry Sparks, Keith Whitley, Ricky Lee, Renfro Proffitt, Hank Smith, Junior Blankenship and myself–we all owed a debt of gratitude to George Shuffler for showing us the way – James Alan Shelton. Shuffler was born in Valdese, North Carolina in 1925. He received his first guitar at the age 12 and was soon appearing on stage in his local district. In 1946 he sat in with The Bailey Brothers who, were so impressed with his playing they invited him to join the band. 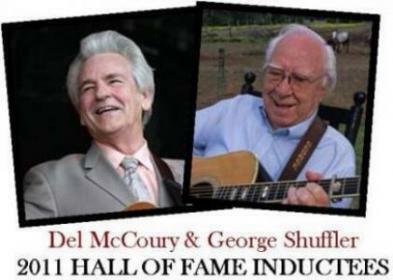 Bluegrass ambassador and the leader of one of the most awarded bands in bluegrass, Del McCoury and pioneering bass player and guitar stylist George Shuffler will be the next inductees into the International Bluegrass Music Hall of Fame. In the department of chill-bump raising, screaming high tenor bluegrass singers, there’s no one dearer to the hearts of bluegrass fans than Del McCoury. With more than 50 years of performing under his belt, nine IBMA Entertainer of the Year awards, a Grammy in 2006 and the prestigious National Heritage Award in 2010, McCoury and his band are universally regarded among the greatest ambassadors for the genre. McCoury first came to national attention as the lead singer and driving rhythm guitarist with Bill Monroe’s Blue Grass Boys during 1963 and 1964, after playing banjo in regional bands in the Baltimore/Washington area for several years. Forming Del McCoury & The Dixie Pals band around 1967, he played the festival circuit, largely in the Northeast. He moved from Pennsylvania to Nashville in 1992, changing the name of his group to The Del McCoury Band, which included sons Ronnie on mandolin and Rob on banjo. McCoury gained national recognition for his hard-edged, high energy style of bluegrass, winning numerous honors. He became a member of the Grand Ole Opry in 2003. Del’s infectious smile and easy-going but always professional manner are as genuine as his musical integrity, which has built bridges for bluegrass to other styles of music and musicians. His collaborations on recordings; at diverse tour dates; and on national broadcast outlets in genres as diverse as jazz, pop, country and the jam band scene are important catalysts for bringing bluegrass to new audiences. George Shuffler influences in bluegrass are as an innovative bass player, guitar stylist and featured vocalist and humorist, primarily as a sideman in some of the most important bands in the music’s history. Shuffler grew up in a large family near Valdese, North Carolina, learning his first guitar chords at age 10. Young George listened to many of the groups performing live on various 50,000-watt radio stations around the country, and Merle Travis was his idol. In the early 1940s Shuffler was working in a local string band with a regular $20-a-week job at a bakery. Filling in as bass player with Charlie & Danny Bailey and the Happy Valley Boys at a theatre and several other venues in Granite Falls, N.C., Shuffler accepted a $60 a week job with the Baileys and left with them for Nashville and The Grand Ole Opry, his first professional job. After the Baileys quit the business, Shuffler worked with a comedy team for a while, returned to Valdese and got married and worked with several bands playing guitar and singing. Carter Stanley called Shuffler on 28th December, 1950 and said he and Ralph were leaving Bristol to move to WVLK in Versailles, Kentucky, and he asked Shuffler to join the Stanley Brothers to play bass—an offer George accepted. Following WVLK, Shuffler worked with The Stanley Brothers in numerous markets. His “walking style” of bass playing, introduced on the Stanley Brothers’ 1953 Mercury Recordings, would imprint itself on a number of younger players, including Hall of Fame member Tom Gray. Primarily a bass player, Shuffler was in and out of the Stanley group many times until the early 1960s, when it got down to just Carter, Ralph and George. Inspired by Bill Napier, Shuffler perfected his signature style of cross-picking that would be widely emulated. Following Carter Stanley’s death December 1, 1966, Shuffler stayed on with Ralph for several months. He then worked with Don Reno and Bill Harrell until 1969, recording several albums with them on bass. For a number of years he also led The Shuffler Family gospel group, which recorded more than a half dozen albums. The Hall of Fame inductions will be one of the high points of the International Bluegrass Music Awards, which will take place 29th September, 2011 at the historic Ryman Auditorium in Nashville, Tenn. If your heading over to Nashville in September, tickets may be purchased online at www.worldofbluegrass.org. The Hall of Fame is housed in the International Bluegrass Music Museum in Owensboro, Kentucky.